Join us in Manchester at Build It Live North West on 23-24 February as we demonstrate building a natural house in the ‘Centre for Alternative Technology Demo Zone’. CAT mastercarpenter and tutor on our Build a Natural House and Build a Tiny House courses, Carwyn Lloyd Jones, will be demonstrating timber framing and cob building. Dieter Brandstatter, who also teaches on our tiny house course, will showcase building with strawbales. Hempcrete and natural fibre insulation will be demonstrated by Alex Sparrow of UKHempcrete and Natural Building UK, who teaches CAT’s course in ‘Hempcrete – retrofitting for self-builders’. We’ll also have people on hand to answer questions about CAT Graduate School courses, so if you can’t make it to one of our open days then come and talk to us at Build It Live. Build It Live North West takes place on 23-24 February at Event City, Manchester. 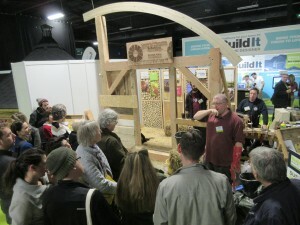 Timber frame joint demonstrations will also be running throughout the show. Click here to unlock 2 free tickets to see the Centre for Alternative Technology at the show – saving £24!